My Toes in the Sand: Newly Remodeled - Directly on the Beach! Amazing view! Totally Renovated luxury in the heart of Seagrove Beach, just a short walk or bike ride to Seaside. Fully remodeled in 2016, Palms A13 features upscale finishes like beautiful quartz countertops, new stainless steel appliances, new kitchen cabinets and new flooring throughout the entire condominium. In addition to a major remodeling of the kitchen, the bathrooms were also updated. 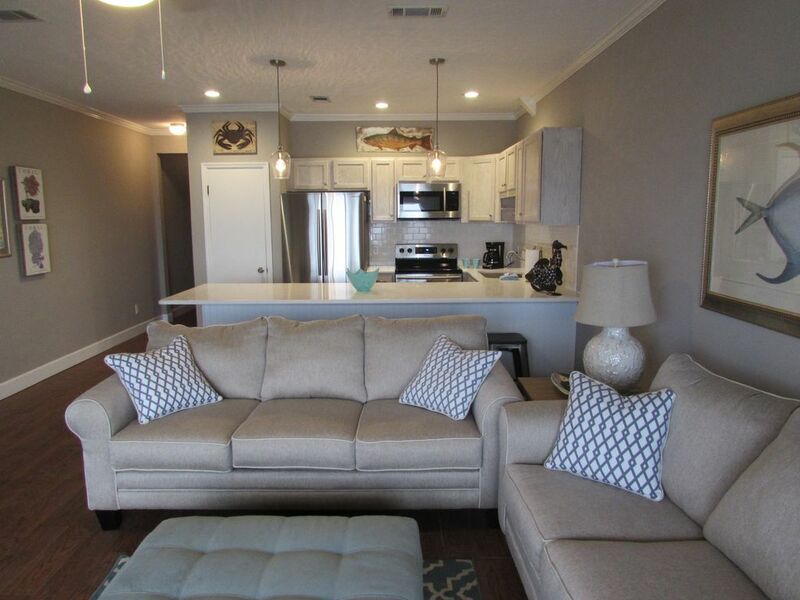 There is brand new furniture throughout the updated condominium. The condominium features one bedroom with a new king size bed, with an adjoining bathroom. There are brand new linens and towels throughout. In addition to the bedroom, there is a sofa-bed in the living room with an upgraded mattress and two bunks in the hallway. There is an additional full bathroom in the hallway as well. Enjoy your morning coffee or your afternoon cocktail on the balcony while watching the beautiful emerald waters. If you are lucky, the dolphins will treat you to a mid-morning show in the gulf. This unit is on the third floor, which maximizes your view of the sugar white sand and beautiful gulf water. The Palms has a private and gated beach access for the guests. Seaside is just a short bike ride away for shopping, dining, and free seasonal outdoor concerts and movies. Scenic Highway 30A offers a 27 mile bike path allowing you to explore the various communities along 30A including Watercolor, Grayton Beach, Seaside, Alys Beach and Rosemary Beach. Cable with 50 inch TV in the den and 32 inch TV in the bedroom. Both are Smart TV's with access to Netflix. Great place...exactly like the pictures! Lovely accommodations and the view is unbeatable. No doubt I would stay here again. Things that need improving: All towels were folded and put away but were dreadfully wet upon arrival, had to rewash and dry them. Know that there are zero hotel size hand soaps or dishwasher detergent left like at other condos I've stayed in in the past. Only one saute pan which is warped so badly I went and bought one myself for the week (no measuring spoons either) . No extra sheet set for the pull out couch were left in the condo. These are all clearly small things that would never stop me from renting this place again. Beautifully furnished. Great location, very nice condo. Ocean Front with terrific view and easy access to the beach. I would stay here again and recommend to friends. Attractively decorated, comfortable, and beautiful view of the beach and Gulf. We would definitely rent this property again if we are lucky enough to be able to come to the Florida panhandle again. Great place. Amazing views! Super nice owners! They even had beach chairs and wake boards in the closet! Love this place! Very neat and clean. Great location, amazing ocean views and easy access to the beach. Definitely made our trip much more enjoyable! Rates are subject to change until reservations are confirmed. There can be additional housekeeping fees on stays less than four nights.